Mr. Eugene Pangelinan is the new head of the Federated States of Micronesia’s National Oceanic Resource Management Authority (NORMA) after his predecessor, Mr. Patrick Mackenzie, resigned from the Executive Director post to pursue other interests. Mr. Eugene Pangelinan brings to the executive directorship 26 years of NORMA experience and dedication. As Execuitve Director, Mr. Pangelinan will take over responsibilities for the management of NORMA, the regulatory authority established to oversee the ocean resources within the FSM’s 200-mile exclusive economic zone (EEZ), including regulation of the deep sea fisheries activities and conservation measures within the FSM’s EEZ. The Executive Director works under the direction and guidance of a five -member board appointed by the president and confirmed by congress. After years of preparation by Papua New Guinea and thousands of Pacific regional athletes, the 15th Pacific Games opening ceremony was held Saturday night, July 4, in the nation's capital, Port Moresby. TEAM FSM, from the Federated States of Micronesia, was one of 23 Pacific island countries and territories that marched at the opening ceremony. 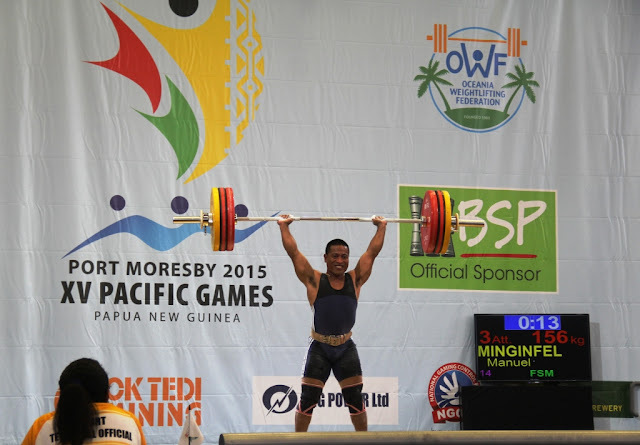 The flag bearer for TEAM FSM was famous Olympic weightlifter Manuel Minginfel, from Yap. TEAM FSM is composed of 42 athletes, coaches and manager competing in Weightlifting, Boxing, Swimming, Track and Field, Tennis and Soccer (Football). Artistic director of the opening ceremony, Airleke Ingram, said the opening ceremony was a celebration of Papua New Guinea's rich cultural history, while pointing to the country's future direction. The sing-sing performances were part of a cast of 3,000 performers and almost 300 ceremony staff. Prince Andrew, the Duke of York, Great Britain welcomed all 23 Pacific region island countries and territories. "I wish everyone 2 successful weeks of sport. Good luck to all the competitors. Congratulations Port Moresby," he said. 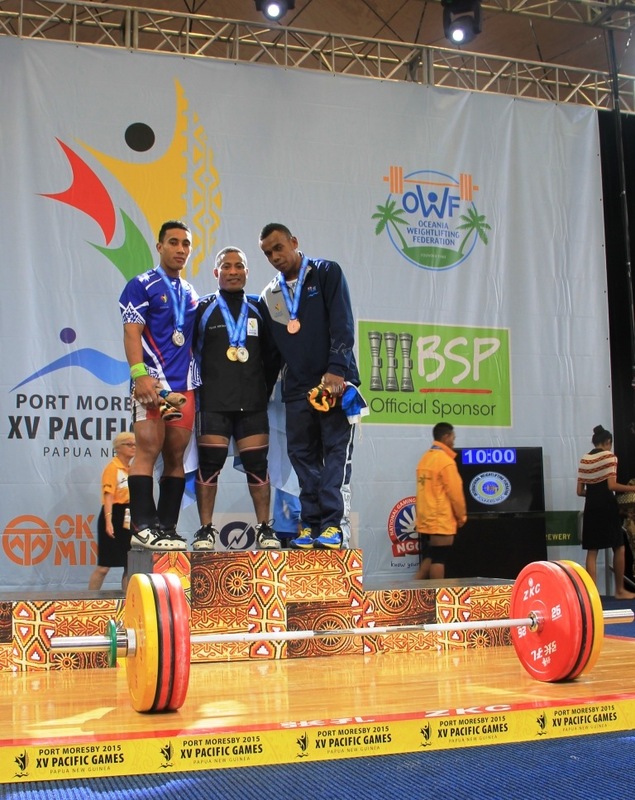 On Monday, July 6, Minginfel, the FSM best hope of winning a medal, will compete in the men’s 69kg Weightlifting category. Manuel's first appearance at a Pacific Games was at the Mini Games in Pago Pago in 1997. Since that time, he has competed in every single Pacific Games and Mini Games, winning a total of 19 gold medals and 5 silver medals. 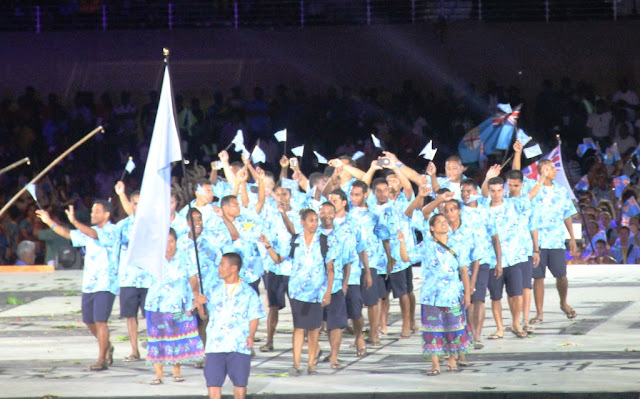 2015 Pacific Games events began on Friday, July 03 and will continue until July 18. Kicking off its second visit of Pacific Partnership earlier last week, on June 25th, Federated States of Micronesia Vice President Yosiwo George visited three public schools in Kitti and Madolenihmw where the partnership mission is currently conducting assistance and support. Reflecting the longstanding relations between the United States and the FSM, the Pacific-Partnership mission that begun earlier last week, have been providing medical, dental, veterinarian care and infrastructure development projects at school grounds where military personnel and volunteers are repairing and renovating school facilities. professionals in support of the mission’s objectives. The USNS Millinocket vessel that deployed from Pearl Harbor late May, has been scheduled for a two-week mission visit in Pohnpei, which arrived in the host nation on June 21. Along with US Ambassador Doria Rosen, Vice President George thanked the engineering personnel at Lukop Elementary School and Rohi Elementary School and the team of medical professionals at Madolenihmw High School for providing treatment and medical aid. The Vice President expressed his gratitude and appreciation for the involvement and humanitarian outreach being provided to the FSM.